According to the scientists who have analysed the find, a baby mammoth which was unearthed from the permafrost of north-western Siberia could be the best preserved specimen of its type. It was discovered on Russia's Yamal peninsula and was thought to have died around 8000 BC. 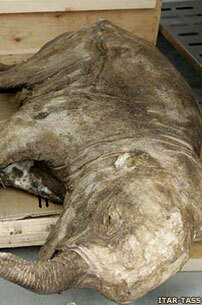 The animal's trunk and eyes were still intact and some of its fur remained on the body. Mammoths are an extinct member of the elephant family. They first appeared in the Pliocene epoch, 4.8 million years ago. What caused their widespread disappearance at the end of the most recent ice age remains unclear; but climate change, overkill by human hunters, or a combination of both could have been to blame. One population of mammoths survived for longer in isolation on Russia's remote Wrangel Island until about 3000 BC. Adults often possessed long, curved tusks and a coat of long hair. This 130cm tall Siberian specimen (four feet three inches), weighed fifty kilos and was dated to the end of the most recent ice age, when the great beasts were vanishing from the planet. It was discovered by a reindeer herder in May 2007. Yuri Khudi stumbled across the carcass near the River Yuribei, in Russia's Yamal-Nenets autonomous district. 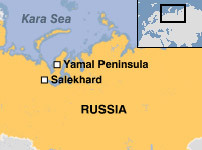 In the first week of July 2007, an international delegation of experts convened in the town of Salekhard, near the discovery site, to carry out a preliminary examination of the animal. The mammoth bore no defects except that its tail had been bitten bit off, according to Alexei Tikhonov, vice-director of the Zoological Institute of the Russian Academy of Sciences and a member of the delegation. Larry Agenbroad, director of the 'Mammoth Site of Hot Springs' research centre in South Dakota, USA, noted that to find a juvenile mammoth in any condition is extremely rare. He added that he knew of only three other examples. Some scientists have long held out hope that well-preserved sperm or other cells containing viable DNA could be used to resurrect a mammoth. This new find could have provided the best chance yet. Despite the inherent difficulties, Dr Agenbroad remained optimistic about the potential for cloning. When the Jarkov mammoth was found frozen in Taimyr, Siberia, in 1997, the geneticists are reported to have said to Dr Agenbroad, 'if you can get us good DNA, we'll have a baby mammoth for you in twenty-two months'. That specimen failed to yield DNA of sufficient quality, but some researchers still believed that it may only be a matter of time until the right find emerged from Siberia. Bringing mammoths back from the dead could take the form of injecting sperm into the egg of a relative, such as the Asian elephant, to try to create a hybrid. Alternatively, scientists could attempt to clone a pure mammoth by fusing the nucleus of a mammoth cell with an elephant egg cell stripped of its DNA. But Dr Agenbroad warned that scientifically valuable Siberian mammoth specimens were being lost to a lucrative trade in ivory, skin, hair, and other body parts. At the time, the city of Yakutsk in Russia's far east formed the hub for this trade. Local people were scouring the Siberian permafrost for remains to sell on. According to Dr Agenbroad, more carcasses could have been falling into the hands of dealers than were finding their way to scientists. These products were primarily for collectors and their trade was usually illicit. Originally it was for ivory, but more recently that market had expanded in a much broader one. Almost any fossil marketing website could contain mammoth hair for highly profitable fees. Russian authorities stated that any mammoth remains would be the property of the Russian government, but apparently little attention was being paid to that. The Yamal mammoth was expected to be transferred to Jikei University in Tokyo, Japan, later in 2007. A team led by Professor Naoki Suzuki were to carry out an extensive study of the carcass, including CT scans of its internal organs.